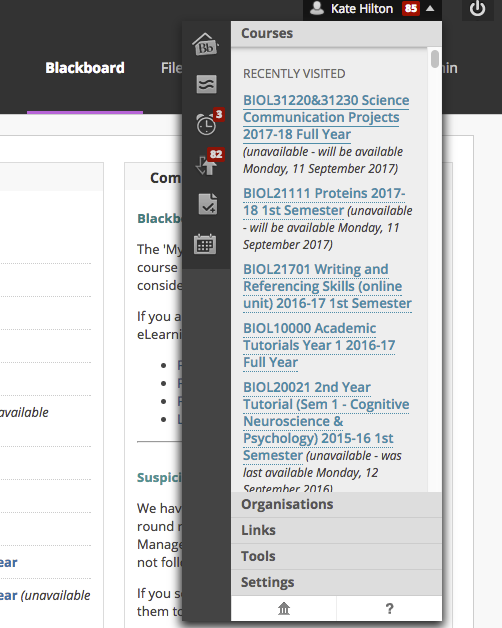 The Blackboard system contains a calendar for each course, but also a global calendar which brings all of your course calendars into one easy to locate area. Please note, that if you are taking a course where the Course Coordinator has not added the dates to the calendar, that nothing will show up in your global calendar. It is therefore wise to double check deadline dates for tests and assignments in each Blackboard course. Where dates are missing, contact the Course Coordinator. Choose the icon that looks like a calendar in the drop down menu. You should now see all the dates in your calendar.